At our house, there is no shortage of stuffed animals. My little ones refer to them as “stuffies”. Sometimes, I wish I could hide them all because they just take over the home! But alas, I remember being a little one too. I would line up my stuffed animals in a row above my bed at night and play with them endlessly during the day with my friends and my sister. It’s one of the great joys of being a kid; having the fascination with those little cuddly toys that seem to comfort you and make your day. I know one day soon when the stuffed animals are replaced with strange and ugly action figures, I will be wishing back for these days! My oldest has made himself a list of all his “stuffies” and each day he takes one around with him. He says “this way they all have a turn and nobody is left out”. He’s five. Love it! Another great project in giving is something I started two years ago. One of our closest little friends was going to have her birthday soon, so I took my three to the Build-A-Bear Workshop nearby. We set out knowing the bear we were going to make was for our friend and not for them. It was a little difficult once we were actually in the store and there were a ton of choices. Each of my children had a favourite, and then I had to explain again that the bear we were making was for our friend and not them. I also explained that maybe when their birthdays came up, they would get a bear. All in all, they were well behaved and were more than thrilled to make something for their friend. They chose something just perfect for her, and got a real kick out of the creation process. Their most favourite part was pressing the pedal to stuff the bear! When it was time to choose something extra special, all three of my children sang “Happy Birthday” to their friend in a sound chip that was placed in the bear’s paw. The bear got a birth certificate and a special box with a ribbon. They couldn’t wait to go to their friend’s birthday party to give their special gift! Since then, Build-A-Bear has been one of the places we go to for personalized presents for friends (and not just children!). My kids made special bears for Grandma MOE, as well as their great-grandmamas in Europe. The sound chip makes them all so happy to have a little recording of the kids forever. Right now, Build-A-Bear is having an ANY event until August 16th. You can get any make-your-own animal, any outfit and any pair of shoes for the bear, all for $34.99. 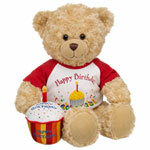 It’s a great time to go and make a bear for someone who will be having a birthday in the near future! Let me know if you plan on going and if you do go, what did you choose? *Disclosure* I was compensated to attend the ANY event at my local Build-A-Bear Workshop. All opinions expressed in this blog post are my own. Pita Pizza Recipe – Ready in 10 minutes! I would like to build a bear for some of my close friends. She celebrated her birthday this August and I think giving her a personalized gift such as this would be a great idea! I commend you for your skills in craft and for giving children an option to create something special for people who are close to their hearts.